This is the adapter plate. It will mate the electric motor to the stock manual transmission. 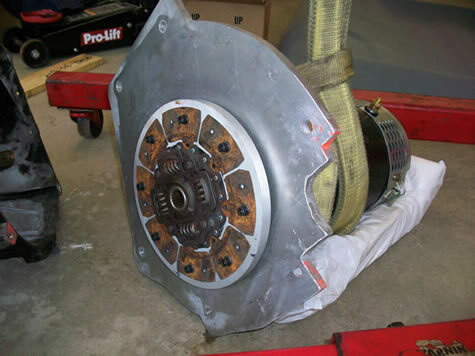 In the center, you can see the original clutch disk from the manual transmission. This was used because it has the splines to match the transmission shaft. 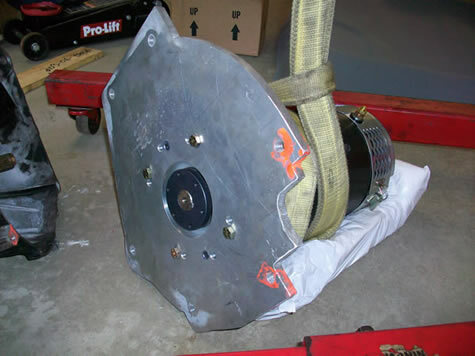 The first step to install the adapter plate would be to make it fit onto the transmission bell housing. 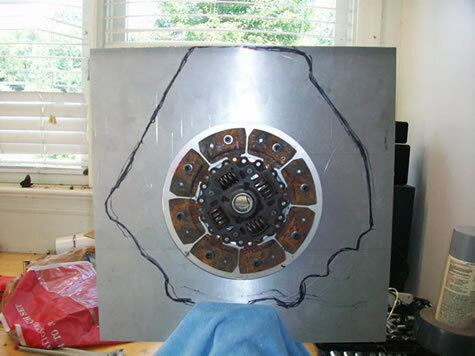 The plate was fitted onto the transmission (now removed from the car) and the outline was marked. I cut the outline using a sawzall. The aluminum was 1/2" thick. The sawzall wasn't made to do this. I blew through a ton of blades before arriving at the final, cut shape. This took a while because it wasn't the best way to do it. It would have been great to use a CNC mill to make this cut exactly to spec, and it could have had some pretty beautiful finish. I just didn't have the resources at the time. The plate now matched up with the face of the transmission, but it needed the mounting holes to be drilled. After securing the plate to the transmission, I sprayed spraypaint into each hole on the transmission, leaving a circular mark on the adapter plate which I would drill using a drill press. Again, this wasn't terribly accurate but it definitely worked. 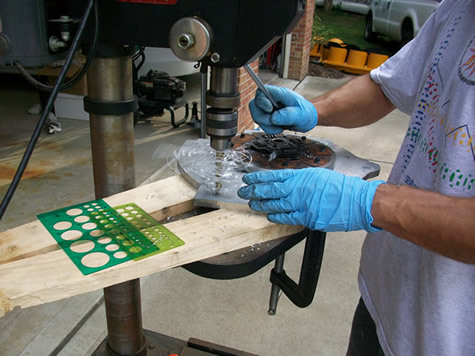 The holes were marked, sized, and drilled with a drillpress. After all the holes were drilled, it was time to attach the adapter plate to the electric motor. Here's the process, in pictures. This part was really exciting! 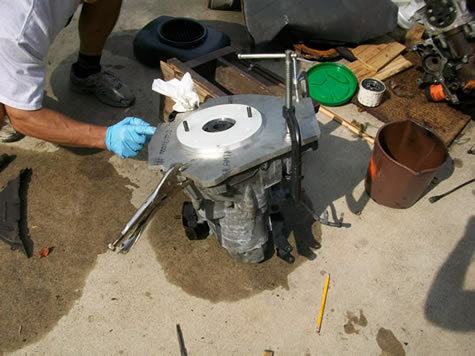 First, I laid the motor on its foam packaging and held it up at an angle with a sling using the engine lift. Next, the motor coupling was installed. 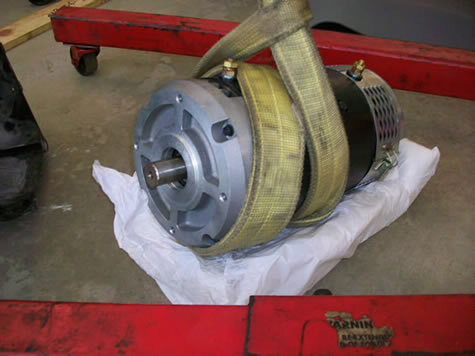 The circular coupling slid over the motor shaft and a small lock key was hammered into place so that it would become stuck to the motor's shaft. 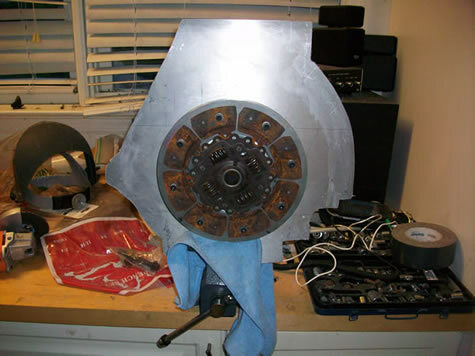 Next, the adapter plate was installed onto the face of the motor. 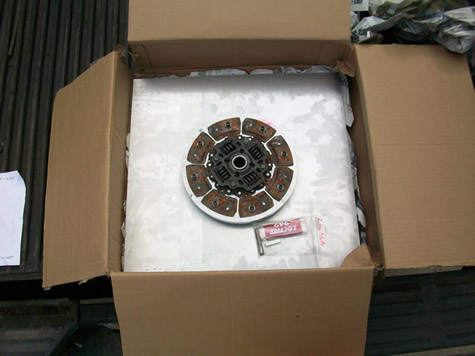 The coupling and motor shaft are able to spin freely because of the large hole in the adapter plate. Next the aluminum clutch holder is installed onto the coupler. 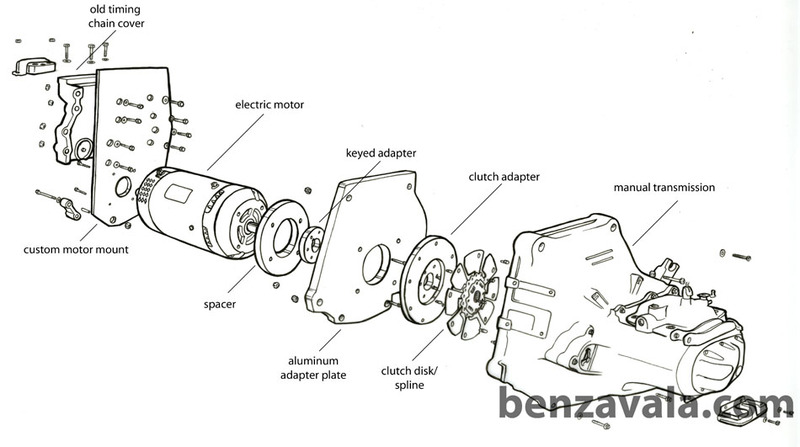 The clutch holder spins with the coupler and motor shaft, while the adapter plate and motor body remain stationary on the car. Finally, the clutch disk is installed onto the clutch holder. 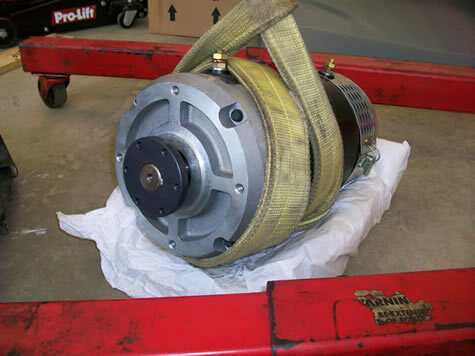 Now, the electric motor is ready to be bolted onto the transmission! 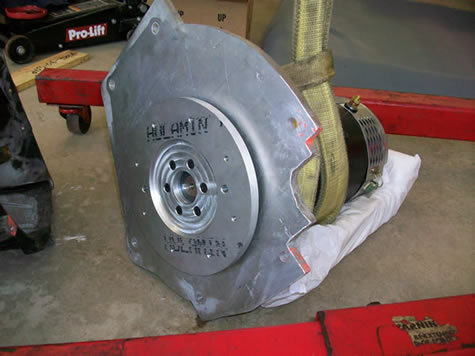 Here, the motor and adapter plate have been installed onto the transmission. Everything is tilted so that it was installed vertically, with gravity helping to hold things in place. Notice that I also installed the old X-shaped engine mount. This will be useful later. The transmission was pressure washed before this process, making it much easier to work with. After everything was bolted together, I installed the drive assembly into the engine bay. The original engine and transmission were designed to be mounted transversely (sideways), so this is the way I installed the electric motor. 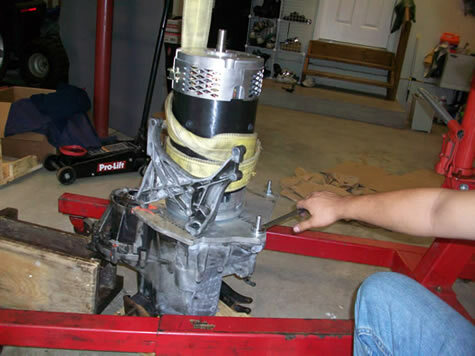 On the right, the transmission fit right into place the way it was designed to, and on the left, the electric motor was mounted to the car's original engine mounts. I used a part of the engine (the timing chain cover I think) and some sheets of aluminum to connect the motor to the car's engine mounts. This way, the new electric drivetrain was mounted on the same mounting points as the original engine. No worries about vibration or stress points. I had to create a connection below the motor to connect it to the car's subframe. I used a "dogbone" style mount which lined up nicely with the black aluminum plate I used to mount the motor to the timing chain cover. It also used to be an engine mount, so it was a perfect place to balance the new motor. You'll notice that the motor's shaft is sticking out. This is called the "secondary shaft" and it could be used to run accessories. I won't be using this, so it will be left open.